Many of us will need hearing aids at some point in our lives. But will we be ready to accept them? That’s one of the challenges faced by Oticon, a hearing aid manufacturer that has been around for about 100 years. The long trip through the sales funnel typically takes from five to seven years, and people have to be gently brought along at every stage, says Stephanie Young, director, digital strategy and e-commerce for Oticon. That’s where email comes in. “Once we capture lead, we nurture that lead,” Young says. The hearing aids are not sold via email — this is a direct-to-consumer effort, meaning that hearing care professionals sell the devices and the patients ask for them. The doctors also get monthly emails. Oticon previously relied mostly on traditional marketing channels, but when Young came on board about five years ago, she began moving it toward digital. This program began with generating leads in several channels — “paid media, search, and social media, Yahoo Native and YouTube,” says Michael Dub, a partner in DXagency. “The landing pages were developed specifically for this campaign,” he says. People who responded on the relevant page were then brought into the email program, their addresses being obtained directly or through locators. DXAgency then “identified target audiences and determined appropriate tactics for aggregating these leads for remarketing,” Dub continues. They identified audience segments, consisting largely “older people and also younger people caring for a parent or relative.” Personas were then built using Oticon research. Those prospects get monthly emails based on their segment and stage in the funnel, Young explains. They are deemed live leads because they apparently have taken the first step in seeking care — admitting that there is a solution. One recent email, with the headline “October is National Protect your Hearing Month,” offers tips for protecting yourself. Another email, apparently to physicians, highlighted the Oticon HearingFitness App for Opn. 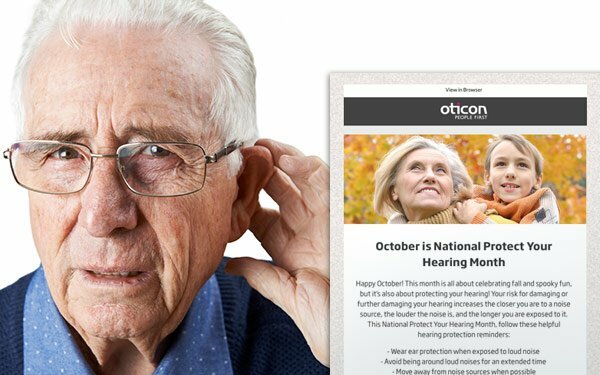 “The world’s first hearing fitness technology, Oticon HearingFitness, gives Opn users advice and encouragement. In addition to email, Oticon produces videos, brochures, and a variety of content for doctor’s offices. Hearing care professionals also receive monthly emails. Oticon produces a small, discreet hearing aid that provides high-end technology at several different price points. Although she did not provide specific details on email results, Young said the email campaign has cut conversion time in half, and that email open rates have doubled. Communication with end users doesn’t end at purchase — there is ongoing nurturing, upgrades and accessory sales.